Proper preservation of wedding gown becomes important, when you want to cherish the dress for the lifetime. Explore the article to find tips on how to preserve your wedding dress. You spent a great time in selecting that perfect dress for your wedding. You may now hope that the beautiful wedding gown be worn by your sister or your daughter on their 'big day' or you may want to treasure your wedding gown for sentimental reasons. In both the cases, you need to preserve the dress, in order to retain its beauty for the coming years. Many people do not know how to preserve their precious wedding dress and often end up in either spoiling the color or fabric of the gown or even staining it. If you are also in such a situation, then this article is just for you. Check out the following lines and know how to preserve your wedding dress. People often dispose off their wedding dress bags, thinking that the plastic bag would be of no use in the future. A little known fact is that the bag can be very handy, when you want to preserve your wedding dress for the future. So, make sure to save the bag in which your wedding dress came. 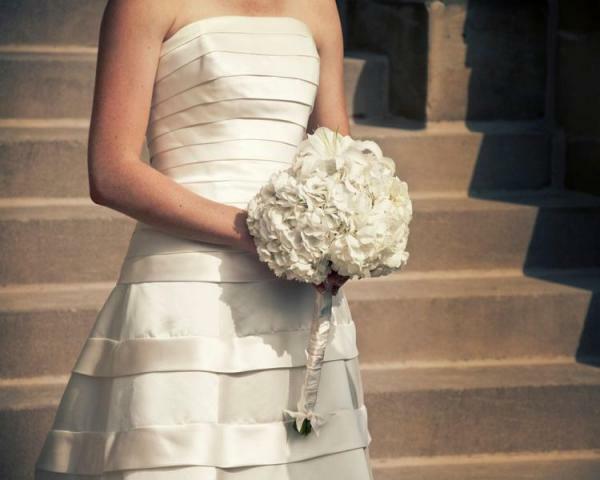 In addition to the bag, you will need a clean, white cotton sheet to wrap the wedding gown. Wash the cotton sheet in hot water, before using it for the purpose. Do not use detergent to wash the sheet, because the chemicals might ruin the fabric of the sheet and eventually, your wedding gown. Send your wedding dress for dry cleaning, one or two days after the wedding ceremony is over. Ensure that you send your precious gown to a professional dry cleaner, who specializes in preserving formal gowns. You may get some help from the bridal shop, about a good dry cleaner. Ask the dry cleaner to take care of your gown, during the cleaning process. Alert him about the stains in the gown, if any. If the ornaments in the gown are glued on to it, rather than sewed, do not forget to inform the cleaner about the same. This is very important, because the ornaments often fall off during the cleaning process. Ask your dry cleaner to wrap the wedding gown in a clean, acid-free tissue papers. Be sure to mention that you want the high quality tissue papers to be put in between the folds of the gown, to avoid permanent wrinkles on the dress. Ensure that the dress is stored in an acid-free box, since the chemicals present in the acid can spoil the fabric of the gown. If possible, ask the cleaner to wrap the dress in an acid-free box, after completing the cleaning process. After you have collected your wedding gown from the dry cleaner, place it in your closet, in a very neat manner. You may hang the wedding gown in a padded hanger, to avoid wrinkles. The wedding gown should be stored in a cool, dry place, away from direct sunlight. The temperature of the store room should also be taken care of. This is because the temperature has an indirect effect on the fabric of the gown, after it gets treated with chemicals during the dry clean. Inspect your wedding dress on each anniversary to check whether it is in good condition or not. Make sure that you allow the dress to 'breathe' and then store it properly again.